They have been dubbed ‘killer robots’. Concerted international action is needed to prevent the emergence of weapons which could operate without meaningful human control. 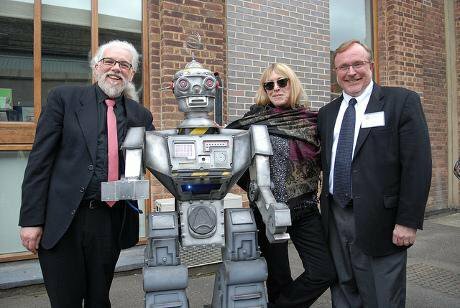 Campaigners against 'killer robots' Noel Sharkey (International Committee on Robot Arms Control), Jody Williams (Nobel Women’s Initiative) and Steve Goose (Human Rights Watch)—plus an unwelcome guest. Flickr / Campaign to Stop Killer Robots. Some rights reserved. With states continuing to research and develop relevant weapons systems, international action is needed to prevent the emergence of fully autonomous weapons—systems which, once activated and their mission defined, could select people or objects to attack without any further human intervention. Last week, 89 countries participated in a second informal meeting of experts on ‘lethal autonomous weapons systems’, within the framework of the United Nations’ Convention on Certain Conventional Weapons (CCW). International organisations, NGOs and academics, including roboticists and ethicists, contributed. This issue has now been on the international agenda for two years, in part due to the Campaign to Stop Killer Robots, which is calling for a treaty to ban fully autonomous weapons. Despite most states rejecting weapon systems that operate without human control, a decisive and co-ordinated response has not been forthcoming. Discussions must now advance towards an international prohibition, before the speed of technological development overtakes diplomatic processes. Whether used in an armed conflict or law-enforcement context, fully autonomous weapons would fundamentally challenge the relationship between human beings and the application of violent force. The core issue remains whether the act of using potentially lethal force should ever be delegated to hardware and software systems, which cannot hold responsibility. This fundamentally dehumanising possibility was firmly rejected as unacceptable by a large number of states and civil-society organisations last week in Geneva. Experts, including the UN special rapporteur on extrajudicial, summary or arbitrary executions, highlighted the affront to human dignity it would represent. The discussions, chaired by Germany, were mandated to examine autonomous weapons systems in the context of the purpose of the CCW, which is to ban or restrict the use in armed conflict of specific types of weapons that “trouble the conscience of humanity”. The treaty specifically recognises the need to “continue the codification and progressive development of the rules of international law”—as existing rules will not always be adequate in a changing world. Since the latest discussions were informal, the only official outcome will be a summary report to the next meeting of the 120 states-party to the CCW, in November. States will make a decision then on how to proceed—including considering the option of negotiating a new protocol on autonomous weapons systems. This makes the next few months crucial for galvanising commitment to action. Autonomous weapons systems were discussed at the Human Rights Council in 2013 and at previous meetings in the framework of the CCW in 2014. Some states have presented policy positions to these forums but little information is available on what weapons technology is being developed, and few states have elaborated comprehensive policies on autonomous weapons systems. States with high-tech militaries—such as China, Israel, Russia, South Korea, the UK and the US—are investing in autonomy for various functions of weapons-systems technologies. But no state has explicitly stated that it wishes to obtain ‘lethal autonomous weapons systems’ as discussed at the CCW meeting, or that it is actively pursuing them. A clear, co-ordinated leadership group for a ban has not yet emerged. Many appear still to be determining their position—or considering what they should reveal at this stage—including how they should align with others with whom their interests may coincide but who are not their normal allies. Attendance at the discussions was high, due to considerable interest. There was also high interest from media and national parliaments. A number of state and civil-society delegates however noted a serious under-representation of delegations and statements from countries of the global south, which were also less likely to have brought experts from their capitals given the lack of a sponsorship programme associated with the CCW. Perspectives from potential developer countries risked being over-represented. Only Israel and the US indicated last week that they felt the door should be left open on these weapons’ development. A number of states, including France, Japan and the UK, wished to make clear they had no intention of developing them—though France and the UK do not support their prohibition. No states have put in place a national moratorium, as recommended by the UN special rapporteur to the Human Rights Council. Those who support a ban include Bolivia, Cuba, Ecuador, Egypt, Ghana, the Holy See, Palestine, and Pakistan. Others said prohibition or new legal regulations might have merit, without making firm commitments. A clear, co-ordinated leadership group for a ban has not yet emerged. Given that there appears to be a consensus within the CCW context that the development of ‘lethal autonomous weapons systems’ would be undesirable, the main point of contention is what the international response should be. A range of critical ethical, technical, legal, strategic and regulatory concerns were discussed over the five days of meetings in Geneva, with different options proposed for next steps as a result. Measures to increase transparency and encourage national legal reviews of weapons were proposed by some states, led by the US, to deal with the concerns raised by autonomous weapons systems. A better understanding of technologies under development would certainly assist international discussions by making certain issues more concrete. Reviewing the legality of the technologies of violence states could deploy is also an important obligation (originating in additional protocol I to the Geneva Conventions and a customary obligation on states not party). But these are procedures which states should be undertaking in any case, insufficient as a specific response to autonomous weapons systems. National-level weapons reviews cannot give a global answer to the ethical questions raised by such systems. Autonomous weapons would represent an unprecedented development, which could not have been foreseen when current laws were made. Concerted consideration by the international community is therefore required. Weapons reviews are conducted by individual states and their results are not made open to scrutiny. They also only examine strictly legal questions in relation to the conduct of armed conflict, yet autonomous weapons systems should not be subject only to legal reasoning, given the fundamental moral issues raised. Members of civil society and some others have advanced the principle, to structure this debate, of requiring meaningful human control over every individual attack. Certain weapons systems would be prohibited as a result. In Geneva this concept was aired, and debated, more than ever before, in both states’ statements and expert-panel discussions. Numerous states asserted that work on autonomous weapons should include a focus on this issue, and on reaching consensus on where the acceptable limits of meaningful human control lie. This offers the most promising avenue towards a collective international response on autonomous weapons systems. More in-depth discussion is needed, proceeding from how states ensure sufficient control over existing weapons systems. This will help to operationalise the principle, and can help lay the foundations for a legal instrument prohibiting systems that do not comply. A small number of states doubted the utility of discussing meaningful human control, pointing to the lack of an accepted definition, or referred to the issue using slightly different formulations. This represents a stalling tactic. Rather than posing a problem, the ambiguity gives an opportunity for states to build a common concept to deal with autonomous weapons systems—as, for example, the concept of ‘unacceptable harm’ helped frame discussion on the prohibition of cluster munitions. A formal process of work to prohibit fully autonomous weapons should be set in train. This should home in on elaborating and agreeing the key elements of ‘meaningful human control’. The 2016 review conference of the CCW will no doubt be a significant marker. Sri Lanka, which will be CCW chair at the next meeting of states-party, has already pointed to the precedent of the pre-emptive prohibition of blinding laser weapons by a CCW protocol. Given the relevance of autonomous weapons systems to law enforcement as well as armed conflict, they should also be considered in the Human Rights Council, as a number of states have pointed out. Some states argued in Geneva that both the technology and the debate on autonomous weapons systems were in their early stages. The urgency of swift consideration was highlighted by robotocists, who pointed out that the debate not only concerns advanced artificial intelligence decades away but also systems using sensor technology which could be built now or in the near future. If the consensus approach associated with the CCW impedes take swift action, the process to prohibit fully autonomous weapons will need to be taken forward elsewhere. Like us on Facebook to follow the latest openSecurity articles, and tell the editors what we should publish next.